I’m worried that we’re not even really trying that hard anymore, since this year’s “possible thunderstorms” have mostly turned out to be actual, violent thunderstorms, but I was determined to do something. One of our boat’s most annoying problems is that our main cabin lights stopped working. When the windows were funneling rain water into the boat, a lot of it apparently traveled directly to the cabin lights, quickly dissolving their internal components. I’ve been sitting on replacements for a couple weeks, and decided that while it would be such a quick fix that it barely warranted a drive to the shore, at least I’d knock one item off the list. Snip snip, crimp crimp; done. Of course, this is not the way of boats. The two wires that went to the cabin light on port were blue and black, which are not standard colors for anything that I’m aware of. I could have guessed that black was negative, but I wanted to be sure…the old lights were incandescent and the polarity was irrelevant, but the new lights are LEDs. LED stands for “light emitting diode,” and the fundamental property of a diode is that it conducts current in only one direction, so polarity counts. I cut the wires and threw a meter on them to figure out which was positive and which was negative, but didn’t get a reading. I checked that the power was on, and that the cabin light breaker was on. I checked the starboard side light, and it was showing voltage as expected. I noticed that the blue wire was only a short little thing, less than 6 inches long, which was spliced into another blue wire with a non-marine-grade crimp. I started wondering if that had also been corroded, or if I disturbed it and caused it to fail, so I cut that and tested it. Nothing. This is when I noticed that it was 100° or so in the cabin, and I was sweating as if I were being paid by the pint. I’d opened the hatches, but the wind was light and on our beam, so it wasn’t really getting in. Our fan produces 10dB of madness-inducing racket for every 1kt of wind that it can kick up, but I cranked it to “OSHA noise hazard” anyway. I decided that I’d just re-run the wire. 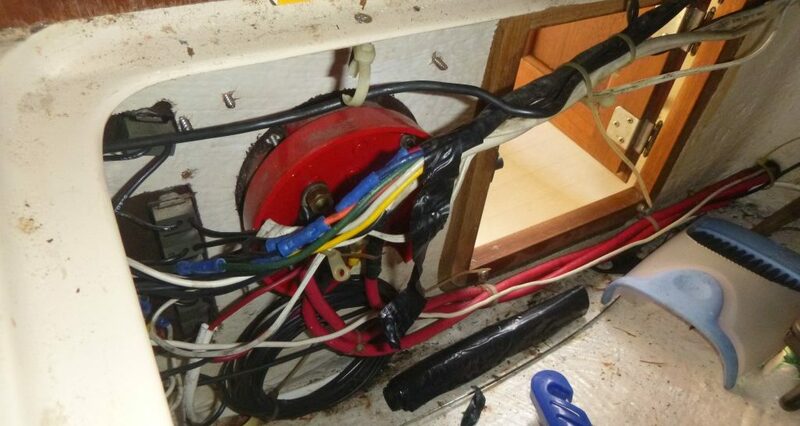 Most of the wiring on our boat looks like it was crocheted by sparrows, so I thought it would be best to have at least one wire run that made sense. In my mind, the key to this was to use the existing wire as a messenger—connect the new wire to the end of the old one and effortlessly pull the old one through until the new one was in place—but I wasn’t sure how it even got to the switch panel so I tried to follow it. First, I got hung up trying to figure out where it went in the first few inches. There was a bundle of wire zip-tied together running the length of the salon, but the blue one clearly wasn’t invited to that party, and was instead jammed way up under the liner. There was another problem where it went into the cupboard above our galley. I figured that out and traced it about 2/3 of the way through the cabinet, but then it got even more tenaciously stuck. The cupboard is 4 inches deep with (non-removable) plexiglass doors to limit my access, and I’d already piled everything on the galley counter, so I needed to move all of my tools and junk to even get near it. There was another splice there, and another short run to a fluorescent light that I assume stopped working during the Reagan administration. I wound up cutting the wire, giving up on using it as a messenger line for that portion of the run, and still couldn’t figure out what was wrong. I’d nearly forgotten that my telephone has a selfie camera, since I’ve obviously never taken a selfie, but I finally figured out that I could use it like a periscope to see what was going on in there. It turned out that the wire run under the fender washers for some deck hardware. Not just one, but both of the washers. Why did it have to be the blue wire? The wire tore when I tried to pull it out from under the washers, which meant that the section to which I was committed to re-running without a messenger was just getting longer and longer. As it exited the cupboard, it turned and ran down, then across the bulkhead on the aft end of the cabin. Here is where things got really exciting: from that point on, possibly 10 or 12 feet given the circuitous path, the wire was entirely wrapped to the rest of the bundle with electrical tape. The whole thing. Neatly wrapped in generously overlapped tape. Passing through multiple compartments. Winding its way around the boat, mummified. I can’t imagine how many rolls of tape or how much time and misspent effort went into the process. I’ve talked about the sheer amount of electrical tape on this boat before. The original halyard was attached with no less than three different colors of electrical tape, which is three too many, given that there is no electrical tape required in knot-tying. I’ve seen runs up to a couple feet long where wires were completely shrouded in tape—sometimes an individual conductor, as if the copper weren’t already insulated in plastic—but I’d seen nothing on this scale. So much for running a messenger. I eventually traced it all the way back to the switch panel, still taped, and then ran one final test with the meter, only to find that the fuse was blown. Given the flash and wide-angle lens, this area looks bright and spacious. It is not. How the starboard side works with a blown fuse is beyond me. It must be on a circuit other than “cabin lights,” which is its own problem, but one for another day. I went to the local marine store and got some more wire and started crimping it in from where the tape catastrophe stopped. This was supposed to be an easy project. I don’t know how this happens. I eventually got both lights working. I also attached the lights for the compass, since I had all the electrical supplies out, and it works too. We’ll get out there eventually. Sorry for your troubles, but we all appreciate you chronicling the difficulties. It’s comforting to know that we’re not the only one for whom every boat maintenance task ends up a herculean challenge.Thanks for the laughs.